Raise your hand up high if you are a parent who has battled the ugly fight of diaper rash wars?? I was very blessed with my first child as she never really got diaper rashes but with my son he has had several bad ones. :( There is a diaper cream that helps heal but also prevent diaper rashes! I was given the sprout cream to conduct a review of the product but all opinions are 100% mine. Thanks to Willow Store for sending me product and the winner of the giveaway! 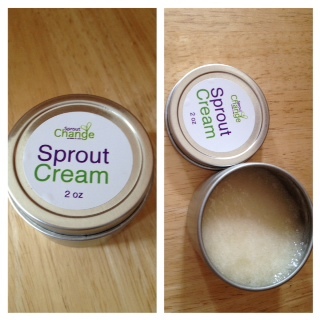 "Sprout Cream is the all-over ointment that works to heal and prevent diaper rash. Great for use with any type of diapers, washes out easily, won’t stain. Sprout Cream uses a unique formula that makes it hard for bacteria to live, but is extremely gentle on delicate skin and promotes the body’s natural healing process as well as reducing the potential for new diaper rash to start. Specially made with food-grade ingredients to keep it safe for baby’s skin. If you could eat it, you can wear it! (although we don’t recommend eating our diaper cream!)" Thankfully my son has not had any bad breakouts in the last few weeks but I still did use and test the product. He has been in wet swim diapers more since we have had a lot of hot and humid days, and I have been putting a little cream on him before and after our swimming and I think it has helped a lot! The cream is a good texture and easy to apply and no strange smells!! I am very happy that the product does not have any strange scents! I like the container to as well as the size, it can fit anywhere.